This bar stool is a hip addition to your rec room setup. Sip a cocktail in style on this contemporary stool. 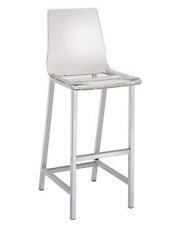 Set includes: Two (2) bar stools. In addition, photo proof may be required. Seat Height: 30 in. Elegance is maximum style with minimum effort. Sensuous oval back done in Rococo-Revival style, with clean-line modern base. Durable, but portable, with excellent design range. Convenient foot rests. Constructed from transparent acrylic, this stunner includes non-marking feet that both help protect sensitive floors and stabilize the stool. Set Includes. Two - Casper Bar Stools. Bedroom Furniture (400).